Panama's culture is the result of its geographical location and history. The movement of people throughout the country's history created a melting pot of cultures that resulted in a highly diverse and unique national identity. There are elements in the folklore of the central provinces that were highly influenced by the Spanish colonizers, such as the national dress "The Pollera" and the golden jewelry that is worn with the outfit. The northern province of Colon was very influenced by its large number of Afro-Antillean descendants that brought some of their customs into the local culture, as in the "Congo Queen" dance and colorful Caribbean outfits. Elements of the local indigenous communities, the original inhabitants of the isthmus, can also still be seen in the country's idioms and traditions, and in their most traditional sense within the indigenous territories. The process of cultural assimilation continues to this day, with every new group of migrants contributing to the melting pot in their own unique way. 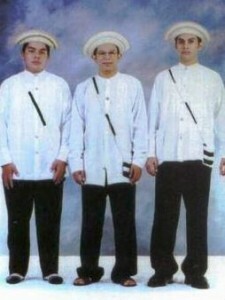 Panama's national outfit is the Gala Pollera and the Montuno. These originated in the central provinces of the country. The outfit consists of a hand made skirt and shirt, they come in all colors and designs. Here are some images of the pollera and the jewelry that is worn with it: the combs, necklaces and tembleques. Example of a Red Gala Pollera. 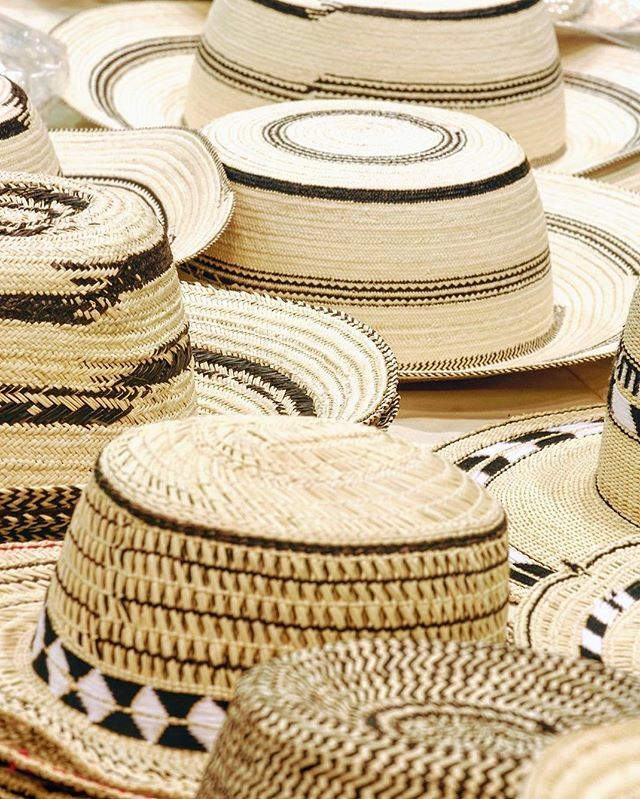 These are hand made by artisans in Panama and many are passed down from generation to generation. 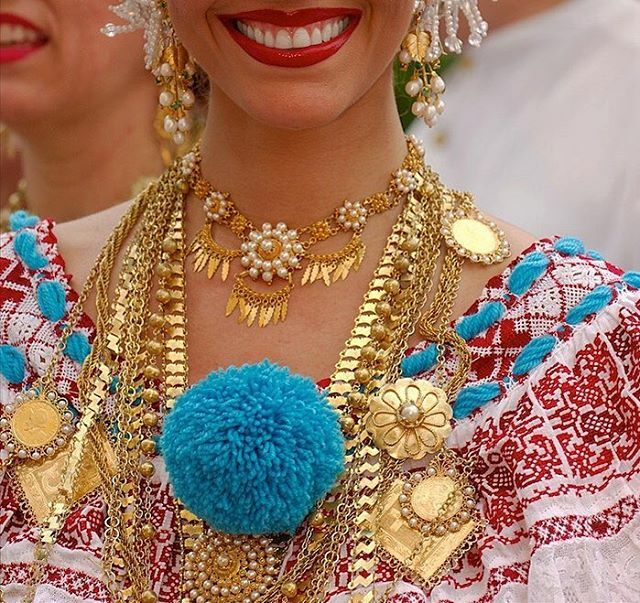 Head Jewelry worn with the national outfit, la pollera. The "peineton" or big comb, and the two smaller combs. The golden jewelry worn with the pollera. Close up of how the jewelry is worn with the Pollera. Traditional hand made hat worn by men in Panama, it is an essential part of the men's national outfit, it is known as "Sombrero pintado"
Example of the formal national outfit for men, known as "Montuno"
If you would like to see a wide variety of polleras in a single place you should attend the Festival of the One Thousand Polleras that takes place in Las Tablas on January of every year. Please visit http://www.desfiledelasmilpolleras.com in the months before January for updated and current information on this amazing festival. Panama's gastronomy, like that of many regions, consists of endemic ingredients that have been prepared in different styles affected by migration. Some of Panama's main dishes include rice and chicken (arroz con pollo), sancocho (a chicken soup with endemic roots), ceviche (fish cooked with lemon, common to other countries of the region). Some common desserts include "huevitos de leche", "cocadas" and "suspiros". Panama city was voted as UNESCO creative gastronomic city in 2017. Traditional chicken soup of Panama, known as "Sancocho"
Panamanian music has undergone many transformations throughout the years. There are salsa, bachata, and even rock artists in the country. However, the most popular genre of music in the country is Reggae in spanish. Some of the most famous Reggae artists in Panama include: Kafu Banton, Eddy Lover, Nando Boom, Mach & Daddy, and Joey Montana. 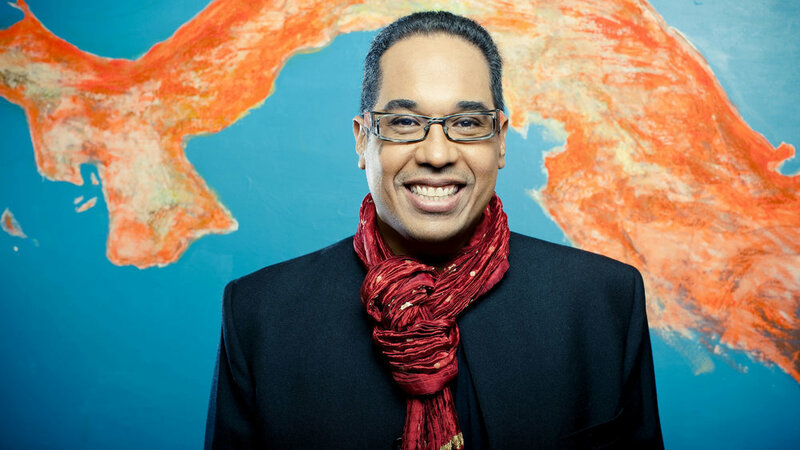 Other renowed Panamanian artists in different genres include grammy award winning Ruben Blades, jazz player Danilo Perez, Los Rabanes and Carlos Eleta Almaran. 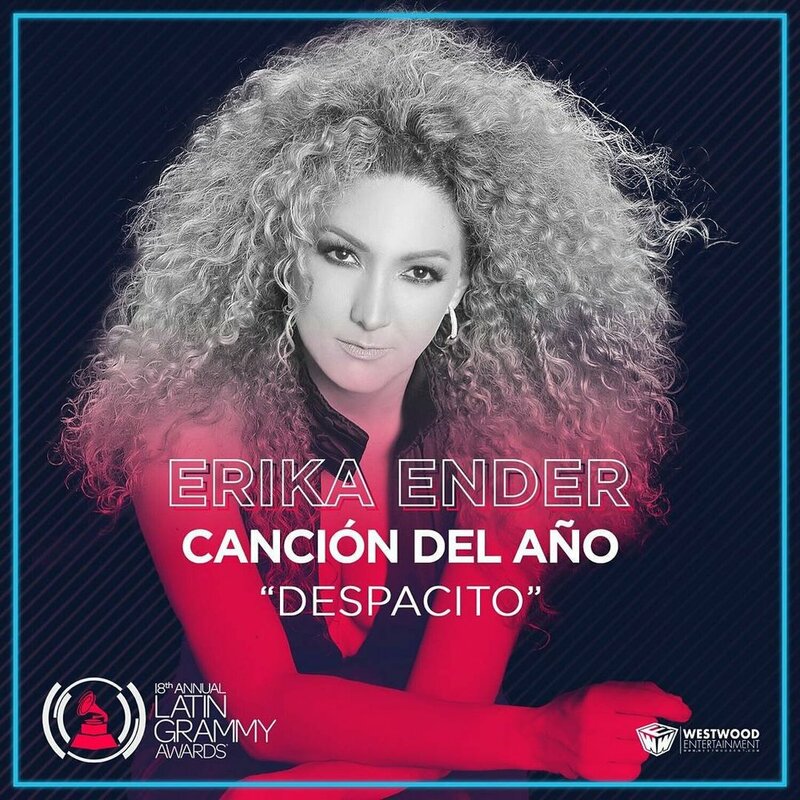 We also have famous music producers, like Erika Ender who was one of the writters of the hit song "Despacito". Panamanian athletes have exelled in a variety of sports. The country won its first olympic gold medal thanks to Irving Saladino in the 2008 Beijing Olympics in the long jump category. Other famous olimpians include Alonso Edward and Lloyd La Beach. The sport that first gained Panama international recognition was boxing through legends like Roberto Duran, Panama Al Brown, Ismael Laguna and Guillermo Jones. Panamanians have gained fame as talented baseball players. One of our most famous players is Mariano Rivera, he was the "closer" pitcher for the New York Yankees. In 2019 he became the first player in history to be unanimously selected for the Baseball Hall of Fame. Panamanian players that are currently playing in the U.S. Major League Baseball include: Christian Betancourt, Enrique Burgos, Johan Camargo, Allen Cordoba, Randall Delgado, Paolo Espino, Severino Gonzalez, Carlos Ruiz and Ruben Tejada. Soccer has increased in popularity in the last 10 years, specially with Panama's classification into the 2018 FIFA World Cup in Russia thanks to players like Luis Tejada, Jaime Penedo, Roman Torres, and Blas Perez. In addition, soccer legends like Rommel Fernandez are still conmemorated in the country. Learn more about the country's soccer team here. Panama scored its first goal in a World Cup in history during its game against England. The player that scored was Felipe Baloy in the 78th minute. At 37 years of age he is now the fourth oldest player to have scored a goal in a World Soccer Cup. Despite losing to England 6-1 Panamanians everywhere celebrated the goal like they had won the tournament, for it was a historic moment for the country and they were very proud of how far their team had come. Players from Panama that are currently playing in the U.S. Major League Soccer include: Miguel Camargo, Armando Cooper, Harold Cummings, Fidel Escobar, Anibal Godoy, Adolfo Machado, Cristian Martinez, Michael Amir Murillo, and Roman Torres. Panamanian cinema has really taken off in the past few years. Famous directors include Abner Benaim, producer of the films El Chance (2009), Panama Canal Stories (2014), and Invasion (2014). Other Panamanian directors include: Ricardo Aguilar, Pituka Ortega de Heilbron, Arturo Montenegro, and Miguel Gonzalez. Documentaries by Panamian directors also include "Minuto 87", about Panama's clasification into the Football World Cup of 2018, and "Congelados en Rusia" (Frozen in Rusia) by Arturo Montenegro. The latest Panamanian films that will premier in 2019 include: Scars of an Orphan and Adios Barbara. To see all the latest international releases of Panamanian films please click here.